Sometimes when Ester McNeil wakes up, she can hear her son’s measured notes coming from the living room on a piano identified, donated and delivered by Southern Illinois University Edwardsville staff and students. When Mary Jo Pembrook, PhD, Performing Arts Program piano teacher, learned that an SIUE employee wanted to donate a piano, Camaron immediately came to mind. 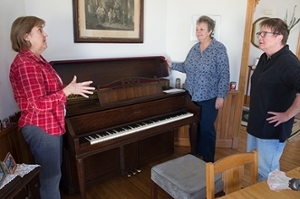 Carol Dappert, graphic designer in University Marketing and Communications, and her wife, Mary Christine McMahon, donated their Baldwin Acrosonic piano from the 1940s to make more room in their home. 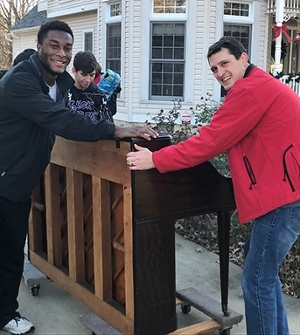 Members of the SIUE Wrestling team moved the piano to McNeil’s house in December 2017 in a moving truck and trailer provided by SIUE wrestling team alumnus Alan Grammer. Providing the muscle for the move were Spates, coach Eric Grajales and wrestlers Jacob Blaha, Tyshawn Williams and Christian Dulaney. “I told my mother that I wanted to play the piano, and I would practice even more if I had one,” Camaron said. The SIUE East St. Louis After School Performing Arts Program will present its recital at 7 p.m. Wednesday, April 25 in Dunham Hall. Students will perform on the piano, guitar and chimes. They will also perform West African drumming and dance, jazz, ballet and the Dunham technique. The recital is free. The SIUE East St. Louis Center for the Performing Arts has a long, rich history. The legendary dancer, anthropologist, and social activist Katherine Dunham founded the Center for Performing Arts at the SIUE East St. Louis Center in 1967. At its peak from 1970-90s, the East St. Louis Center for the Performing Arts provided year-round instruction to more than 1,000 youth and became a training ground for professional artists of all disciplines. For decades, the East St. Louis Center for the Performing Arts provided performing arts classes to students and community members to develop local talent and to cultivate a love of the arts. Classes often culminated in musical and theatrical productions. Mary Jo Pembrook, PhD, SIUE East St. Louis After School Performing Arts Program piano teacher, talks with the couple who donated their piano. Shown (left-right) are Carol Dappert, graphics designer in University Marketing and Communications, and Mary Christine McMahon. Moving the Dappert’s piano to its new home are members of SIUE Wrestling team: Jacob Blaha (in the back), Christian Dulaney (on left) and SIUE Wrestling Coach Jeremy Spates (pulling piano). 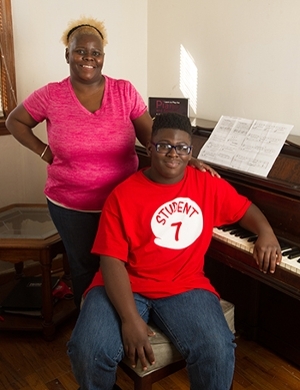 Ester McNeil, of Cahokia, and her son, Camaron Johnson, are thankful for the gift of the piano.